The sequel to my travel horror story (yesterday’s blog) doesn’t get much better (initially). My work trip went off without a hitch and I came home with a new scholarship for my University. This always puts a pep in my step — when I earn my keep. My return flight was delayed. Shocker. I dropped my car at the rental return, took the tram to the terminal in San Francisco and surveyed the amazing array of unique airport shopping and cuisine at SFO. How do they do it? How do they manage to keep out so many redudant chains in this town? I could shop and eat at this airport for weeks! However, my budget wasn’t allowing me any such thing. Back at the gate, there was no power to be found, so I took out my various chargers and extra cords and camped out on a patch of carpet leaning up against a column. The people watching was epic. A distinguished looking man proudly sported a kilt and clogs. Hair of all colors. Svelt looking seniors. Once aboard, things didn’t look so good. I got to my seat and a very sheepish looking Mennonite or Amish (not sure how to tell the two apart, but he wore a suit and she had on a dress and one of those transparent hair bonnets) offered up several boarding passes asking if I might like one of them. Oh. No. It seems they didn’t know to tell the gate agent that they were assigned all middle seats and didn’t have a prayer of sitting together. They just picked a row. I suspect they are used to people doing kind things in their community. Not here on United. No sir. No was was going to budge. Except me, it seems. No one was willing to move. I immediately went forward hoping for an extra seat. It wasn’t looking promising. The flight crew offered to “boot them”. I couldn’t bear that. I’ve been a Mom traveling with a young child. I’ve been a Mom traveling with a young child where my husband was relocated to another area leaving me by myself with the unhappy morsel. I couldn’t do that to them. That said, this wasn’t like going from Baltimore to New York and “taking one for the team”. This was cross country. This was arriving at 1:30am. Ugh. I waited until the last possible moment to sit and found myself cramped between two very large basketball players from Delaware. Their elbows met over my lap and their knees met under my seat-back tray. Good grief. 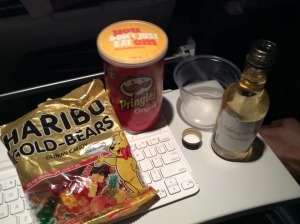 Time came for the flight attendants to take the drink orders and – much to my surprise – my order was taken first. 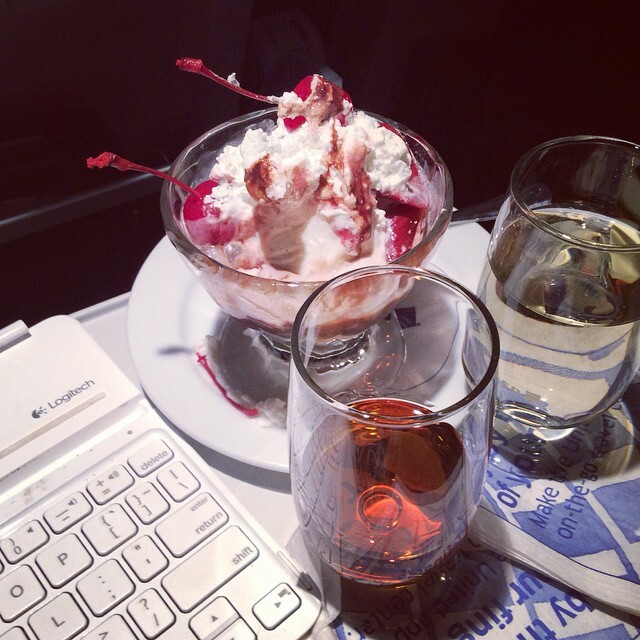 By the first class flight attendant. And it didn’t just come in the flexi-plastic cup. No, sir. This came in a glass with ice and a cloth napkin. WOW. I was beginning to feel a big glad I’d been so magnanimous. Wait – it gets better. When snacks rolled through, the sweet family sent me pringles and gummy bears. I felt like a kid at Christmas. I haven’t had pringles in YEARS. I was really feeling happy I had done my good deed. But there’s more… The flight attendant asked me if I might like some iced cream? She proceeded to offer all sorts of toppings. I replied, “All of them please”. She asked if I might like an aperitif. “Really?” I quietly asked (people around me were starting to crane their necks at me) “Bring it on….,” was my reply. By this point, I think my fellow passengers were feeling a bit sorry they hadn’t been kind and offered up their seat (and, I speculated, they might be thinking they were going to wind up on Santa’s naughty list). 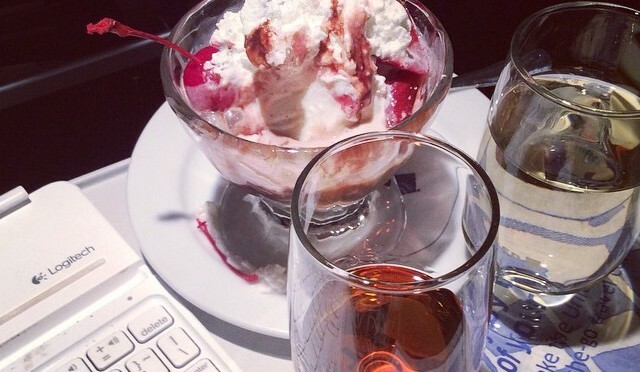 I spent the remainder of my flight in a cozy glow of cognac. I was all Chestnuts Roasting on an Open Fire. P.S. The little girl passenger (for whom I gave up my seat) was the cutest and quietest fellow passenger I’d ever enjoyed. Take that you fellow Grinchy passengers you. I even got to offer her a gummy bear when she came walking up the aisle. Reflection: What gifts might be unlocked by you doing something unselfish?